Lancaster's men kept alive their Grand Slam hopes and consigned France to a third straight defeat despite going behind to a stunning Wesley Fofana try. England rallied through the boot of first Owen Farrell and then Toby Flood, as Manu Tuilagi answered Fofana's try. "We were composed at half-time, we didn't panic," Lancaster told BBC One. "It was a proper Test match. That wasn't the France team that played a couple of weeks ago, that was a really strong, well-motivated French team who caused us a lot of problems in all sorts of areas. "But to show the composure we did - I thought by the end we were the better side in controlling the game. It was hard work and it took us 65-70 minutes to do it. "We gave away a soft try on the blind-side, Fofana's try is one we shouldn't give away at this level. "But we kept the tempo high. Our subs made a big difference when they came on and that closed the game out, really. "We're young in terms of age, there's a lot of 22-24 year-olds out there and I thought the players showed a lot of maturity." England trailed 10-9 at the break but edged in front when Farrell slotted his fourth penalty. Lancaster then rang the changes, bringing on Mako Vunipola, Tom Youngs and James Haskell for Joe Marler, Dylan Hartley and Courtney Lawes respectively. England were rewarded soon after when Tuilagi gathered a loose ball and hared 40m down the left flank to score. France coach Philippe Saint-Andre responded by replacing fly-half Francois Trinh-Duc with Frederic Michalak and making a host of other changes, which appeared to weaken his side. "I thought we gained the ascendency at that point, there's no doubt about it," said Lancaster. "As a coach I'm thinking about my own substitutions, but you do cast a glance at the changes they are making. "As they came on I guess they wanted to break the game up, but it played into our hand because our defence got stronger." England captain Chris Robshaw, who earned the man-of-the-match award and was labelled as a "rock" by Lancaster, attributed England's victory to an improved defensive effort. "We were a little bit slow coming out of the blocks," Robshaw told BBC Sport. "Our defence in the first half was pretty sloppy. Once we sorted that out it was pretty good." He added: "All games are won in the last 20 minutes or so, no matter who we are playing. "Luckily we got a couple of penalties towards the end to give us a bit of daylight." "We expected a little bit more from our bench," he said. "So many times we tried impossible offloads and lost the ball in the contact area and England didn't do amazing things, but they were accurate and we were not accurate enough. 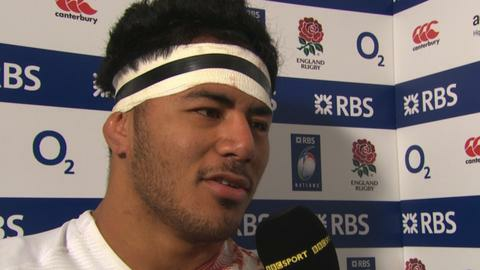 "We had an opportunity at 10-9 for more points when England were not as confident, but we didn't take it. We have to learn from this and carry on."